Navigation is the art of keeping your vessel clear of trouble while getting where you’re going. At sea, navigation is your ounce of prevention. This 3 minute tutorial will introduce you to the basic navigation functionality of MxMariner. If you’re getting started with navigation on Android or iOS devices download SavvySalt’s click here to download Ultimate Guide to Smartphone Navigation. This will jump start your foray into Android or iOS navigation. Whether you’re getting started or you’ve circumnavigated the globe there is always more to learn about navigation. What is your next step? Take this survey and make your voice heard and perhaps SavvySalt can further help you on your journey. Or just send a quick message – I read every message! If the embedded form below isn’t working for you take the survey here. This video is an introduction to the basic functionality of MxMariner. To navigate the charts you simply drag the screen around as you would any other map app. Zooming can be accomplished by a pinching gesture or the zoom buttons in the bottom left corner. My zoom buttons are disabled to reduce clutter. If your chart gets turned around while you’re zooming and scrolling use the top right hand corner arrow to re-orient yourself. Note that by default as you move the cursor, which is the small cross mid screen, MxMariner shows you the distance between the cursor and your gps position in the upper left corner. To measure distances you position your cursor, the mid screen X, over the start point. Then you un-hide and click on the measure distance tool. Then pan and zoom the cursor to the destination point. Here we’re measuring the width of Boston North channel; between two lateral buoys. The distance is in the top left. When you’re done you click on the red arrow to exit. A route is a set of lines that lead through a sequence of waypoints. To start a route you you position your cursor over the start point then un-hide and click the route tool. Then move the cursor to the next waypoint and click on the “next waypoint” button. Note the route data is continually tabulated in the top left corner. When you’re done position the cursor over the last waypoint and click on the “finish route” button. Name your fancy new route and save it if that’s your pleasure. The last basic feature of any chart plotter is creating a track. 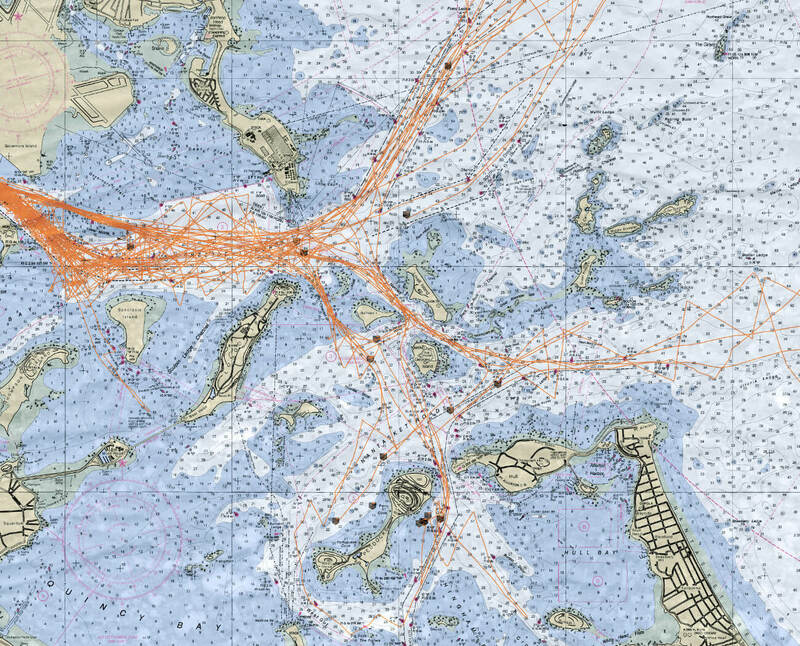 The track in MxMariner is an orange line that shows you where you’ve been as your ship icon traces it out. Un-hide and click on the track button to start a track. Here we’re tracking my commute on the T.
Click the track button again to toggle tracking off. And we’re done! As I said this was just an introduction to the basics of MxMariner. If this intro has helped you out please give this video a thumbs up and have a look around; SavvySalt has an abundance of material on navigation and seamanship.